Is Foil Backed Bubble Wrap Good To Insulate A Shed? Hi John. I was looking through your site and was wondering if I may ask your advice? I am about to attempt to insulate my garden shed. It's an 8x6ft approx. 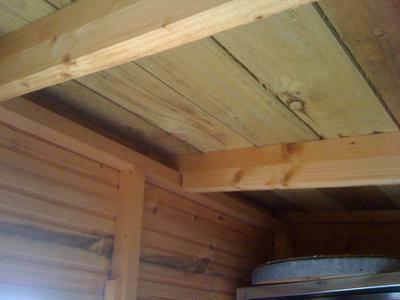 wooden shed with a wooden floor that sits upon a slabbed surface. I use it mainly for storage but I do find myself out in it a lot as I keep a lot of my car detailing stuff in it. Mainly I need it to be as dry as possible for the sake of cloths and towels. Like most other sheddies I store some DIY things there too. So the idea of the insulation was just to keep some of the cold out and some of the heat in during the spells I find myself using the shed. Over time I may line the walls with some plywood or OSB. Not too sure yet. I have just bought 2 rolls of foil insulation. The stuff that's sort of like foil bubble wrap. I am going to staple it to the walls and roof leaving an air gap between the wooden walls and the roof. My question firstly is does this sound right? Secondly, will the foil insulation attract any condensation? I've just managed to get the shed itself watertight and don't want any moisture collecting. Also, what would you advice be on using the foil insulation on the floor? I have carpet down already but could some insulation be put down under this? Comments for Is Foil Backed Bubble Wrap Good To Insulate A Shed? Thank you very much for your question and also the pictures. Nice looking shed that you have there. On the face of it, your problem looks fairly simple. But it really got me thinking about the issues and solutions that many people face when trying to work out how best to keep a comfortable temperature inside their shed. I soon realised that there isn’t a single ‘right’ answer. So if you have got a moment (or three!) I thought that I could go through a few of the concepts behind climate control in a shed. Firstly I will have a look at the theoretical aspects you are faced with. Then I will have a look at a couple of solutions that would be great to use in a perfect no expenses spared world. 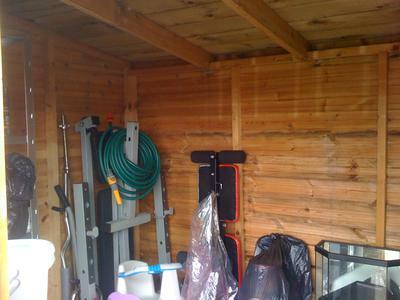 And then have a look at how to optimise your shed with the materials that you have on hand. How do insulation materials work? The best insulation material is a vacuum (hence why we use a vacuum flask to keep the coffee warm). The vacuum means that there is no material to transmit the heat from one surface to another by conduction. After the vacuum, trapped air or an inert gas is the next best option, hence why double/triple glazing is used. All other insulants work in a similar way by trapping air to limit the transmission of heat. Different materials can be compared by a measure called conductivity (or K value). This is measured in Watts/m ⁰C which allows comparison of various materials for a standard 1m thickness. Most walls aren’t a metre thick! So different materials and thicknesses are adjusted for thickness and compared using a U value or R Value. As you can see from the table if you want to stay warm a high R-value is good and this translates to a low U value (if you are in the UK). The most technologically sophisticated insulant is phenolic foam, which performs almost twice as well for a given thickness as sheep's wool. But sheep's wool is a lot better for the environment. These are the multifoil materials, which include foil backed bubble-wrap. These combine a bit of trapped air technology along with using the foil material to reflect radiant heat. This effectively acts like a mirror reflecting heat back to where it came from. If the foil is installed beneath a roof it will reflect back some of the solar radiation in the summer. In a loft, for example, this reflects the solar radiation and stops the heat reaching the inside living space. In the winter if you use a heater then the multifoil reflects the heat back into the room. There are of course some losses, as the material does not reflect perfectly. For foils to be effective the manufacturers require there to be a layer of trapped air either side of the multi-foil. Which as we saw above air is a great insulant. There has been a bit of controversy over this material in the way that the figures are reported. It probably should not be described as insulation but as a ‘radiant barrier’. From looking at the above figures you might think that the best way to build a well-insulated and comfortable shed would be to choose the insulating material with the best U value and line your shed in that. However, life is not quite so simple. There are a couple of other variables to consider, these are ventilation and humidity. When you work in a small space such as a shed, even if it is just a single person if the space is air-tight then eventually the atmosphere will degrade. A person breathing, consumes oxygen in the air and exhales carbon dioxide and water vapour (about 40g/hr of water). Many traditionally built sheds won’t have much of a problem with this as they are fairly leaky/draughty. But if you want your shed to be nice and warm and not to lose heat then you will need to pay close attention to air-tightness. Draughts mean losing heat through air leaks as well as losing heat through the thermal conductivity of the walls. By improving the thermal performance through stopping draughts, you highlight the problem of the atmosphere degrading. The answer to this problem is by controlled ventilation. Using some trickle vents so that the stale air is vented and fresh air is drawn into the building. Or a more technically advanced solution is to install a heat recovery unit. A heat recovery unit is an electrically driven unit that draws fresh air into a building and expels the warm waste air. The clever part is that the heat from the waste air is extracted and transferred to the cooler incoming air. So that very little heat is lost. The heat recovery unit also extracts moisture from the warm air. The warm air inside a heated shed can hold more moisture than the cooler air outside. When warm moisture-laden air meets a cooler surface that is below the ‘dew point’ for a given temperature/humidity then it condenses. For a shed that is not fully insulated, this might occur on single glazed window pane. Or metal fittings that are in contact with the cooler atmosphere outside. For an insulated shed, warm air carrying moisture from the inside may pass through the surface of the wall. As it passes through the insulation it will cool and condense. This condensation can cause a build-up of dampness. If there isn't sufficient air circulation to allow the dampness to disperse, it builds up, allowing fungal growth to occur and the timber to decay. Firstly, what about a garden office for use all year round? In my view the best solution for this would be a well-insulated box with hi-spec, doors and windows. The best solution for achieving the airtightness of the box would be Structurally Insulated Panels (SIPs). These are factory made panels, normally a timber frame with insulation built-in. There are a small number of joints, just at the junctions where the panels are bolted together. As the panels are factory made, the seals at the junctions are very good, leading to very good air-tightness. The requirement for a heat recovery system would depend on the size of the shed and number of people working there. For an office shed with a single person working in it. Most likely the heat from the person working there, the office equipment and lighting may be enough to keep the place at a reasonable 20-21 oC. This could combine with natural ventilation from manually controlled vents. For a larger shed with more than two people and perhaps a kettle etc. then possibly a heat recovery system would be needed. This would provide the mechanical ventilation to control any build-up of humidity. How to design a workshop where the tools don’t go rusty? My solution for this one would take a slightly different tack. Most workshops aren’t kept at a temperature as high as an office where the occupants are sitting down, so say only 15-16 oC. The problem with keeping tools from going rusty is a perpetual one. The problem arises as warmer air condenses on the cold steel. The moisture then allows the iron to oxidise and manifest as rust. This problem only happens when the tools are allowed to get cold and exposed to warm damp air. One solution to this problem is to keep the tools in a dry and warm atmosphere. For me the answer to this is to create an insulated tool storage cupboard. A small heater and thermostat would be installed to keep the internal temperature above the dew-point. The cupboard could be a timber frame with Kingspan infill panels. A small heater such as a light bulb or small 15W airing cupboard heater could be used. Some small ‘trickle vents’ at the top would allow the warmest moisture-containing air to escape. A slightly off the wall thought would be to use an old fridge, with the mechanical parts removed. The fridge is essentially an airtight box with very good seals. In fact it would be good to put in some vents at the top to allow a small amount of air circulation. The use of the 8x6 shed is essentially as a workshop for occasional use. The purpose of the insulation is to make it nicer to work in and also to prevent tools rusting. There is no question that lining the shed with a sheet material will cut out on draughts and reduce heat loss. Looking at the table of insulation values, bubble wrap and foil will have limited benefit on reducing heat loss. There is no contained air gap inside the foil and the air gap outside the foil is fairly leaky I don’t think that there will be much benefit from the insulation value of the bubble wrap. The foil will help to prevent heat build-up on hot sunny days as some will be reflected back out. Also when you use a fan heater in the shed, some of the heat will get reflected back in. To really improve the working conditions inside the shed, foil backed insulation board, or lining the shed and filling the void with a good thickness of insulation fibre (wool or glass) would be a better answer. An alternative route would be to abandon the insulation idea and line the shed with a breathable roofing membrane. This would significantly reduce heat loss through draughts. As the shed is quite small a fan heater would heat the space up quite quickly for occasional use. How to stop the metal tools going rusty and the keep the cloths dry? What about a heated tool cabinet? Forget about foil-backed bubble wrap! A year or so ago I put up a 9' x 7' shed in which I have a work bench, small lathe and a good number of tools and other equipment which really must be kept dry. Like Alastair, I investigated all the pros and cons of a variety of draught-excluding and insulating materials and eventually concluded that none of them would be much good, and that the cost would be excessive if they didn't perform. What I did in the end was to fix sheets of thin plywood to all the internal walls and roof, thereby preventing draughts and, I hoped, leaving an "insulating" barrier of air between the new inner skin and the wooden sides/roof of the shed. I felt very pleased with myself, but as last Autumn approached I went into the shed one afternoon to find tools and other metal items stored on shelves at a higher level in the shed were all dripping with water and beginning to rust. The amount of condensation was unbelievable. My "cure" was to cut a hole in the side of the shed close to the apex of the roof and install a simple bathroom fan. I also invested in a dehumidifier (distributed by a company called "Meaco" here in the UK) and ever since the shed has been kept dry and warm......... and the dehumidifier provides a steady stream of distilled water which is used for ironing and window cleaning (we live in a very hard water area). Doesn't cost much to run, and it is inconvenient having the dehumidifier sat on the workbench, but anything is better than the shock I had at discovering tools covered in water and rust. Only works if you can run mains power to the shed of course! Perhaps I made a mistake by lining the shed with thin sheets of ply and relying simply on the air gap? I'll never know. There must be better ways........ but a brick-built and properly-insulated shed would be quite an expensive prospect. Thanks again for the reply, and a detailed one at that mate. I actually regretted buying the foil insulation afterwards as I suspected it may not be right. It was only £15 so no real harm done. Funny enough I had thought about the membrane myself but dismissed it rather quickly after seeing how cheap the foil wrap was. What I might do now is silicone any small gaps that remain if any at all and try the membrane. A lot of my tools are stored in a chest of drawers so I'm not too bothered in that aspect. I think this would be a good compromise between cost and practicality. What thickness of insulation should you use? Return to Shed Insulation Questions.